109 Beacon is located on the south side of Beacon, between Arlington and Berkeley, with 107 Beacon to the east and 111 Beacon to the west. 109 Beacon was built ca. 1862, one of six contiguous houses (101-103-105-107-109-111 Beacon) built at about the same time and in the same style. The four houses at 105-107-109-111 Beacon were built for George Phineas Upham, for speculative sale, designed as two symmetrical pairs. He purchased the land for 105-107 Beacon on April 1, 1862, and for 109-111 Beacon on May 26, 1862, in both cases from William Warren Goddard and T. Bigelow Lawrence. It was part of a tract of land they had purchased from the Commonwealth of Massachusetts on August 1, 1857, which included all of the land on the south side of Beacon Street from Arlington to Berkeley. George Upham was a wholesale dry goods merchant and sales agent for several cotton mills. He and his wife, Sarah (Sprague) Upham, lived at 122 Beacon. Click here for an index to the deeds for 109 Beacon. On February 28, 1863, 109 Beacon was purchased from George Upham by boot and shoe merchant William Harrison Dunbar. He and his wife, Amelia (Hobart) Dunbar, made it their home. They previously had lived at 150 Tremont. The Dunbars continued to live at 109 Beacon in 1865, but had moved to Lynn by 1866. He continued to own 109 Beacon and lease it to others. By 1868, it was the home of Dr. Charles Gordon, a physician, and his wife, Mary (Upham) Gordon. Mary Gordon was George Phineas Upham’s sister. They previously had lived at 69 Beacon. Charles Gordon died in March of 1872. By 1873, Mary Gordon had moved to 84 Beacon. She subsequently moved to 71 Beacon and then to 77 Beacon, and then, in about 1878, to a new home she had built at 167 Marlborough. During the 1875-1876 winter season, 109 Beacon was the home of Mrs. E. H. Childs. By the 1876-1877 winter season, it was the home of Percival Lowell Everett, a merchant in the China trade. He was a widower, his wife, Elizabeth Davis Williams (Weld) Everett, having died in February of 1875. At the time of her death, they lived at 8 Newbury. By the 1877-1878 season, he had moved to 103 Beacon with their three young children: Louisa Otis Everett, Otis Everett, and Elizabeth Lowell Everett. By the 1877-1878 winter season, 109 Beacon was the home of Anna De Wolf (Lovett) Gibbs, the widow of merchant Franklin Gibbs, and their children, Anna De Wolf Gibbs and Bradford Gibbs. Her mother, Josephine (De Wolf) Lovett, widow of Charles Walley Lovett, lived with them. Mrs. Gibbs and her children had lived in England for a number of years, returning in 1878, when they leased 109 Beacon. In July of 1879, she purchased and subsequently moved with her children and mother to 317 Beacon. By the 1879-1880 winter season, 109 Beacon was the home of hemp merchant and merchandise broker Richard Harding Weld and his wife, Laura Townsend (Winsor) Weld. They initially leased the house from William Dunbar; Laura Weld purchased it from him on October 12, 1881. Richard Weld’s widowed father, Aaron Davis Weld, lived with them until about 1882. His primary residence was Weld Farm in West Roxbury, where Richard and Laura Weld also lived as a second home. The Welds’ two sons, Alfred Winsor Weld, a stockbroker, and Richard Harding Weld, Jr., who was associated with his father’s firm, lived with them. A. Winsor Weld married in October of 1892 to Theresa Weld Davis. After their marriage, they lived in the Longwood section of Brookline. Richard Weld died in October of 1905. Laura Weld continued to live at 109 Beacon. Richard Weld, Jr., lived with her until his marriage in June of 1919 to Bertha Eldridge; after their marriage, they lived at 3 Exeter (he died in July of 1920). Laura Weld continued to live at 109 Beacon until her death in 1921. The house was not listed in the 1922 and 1923 Blue Books. 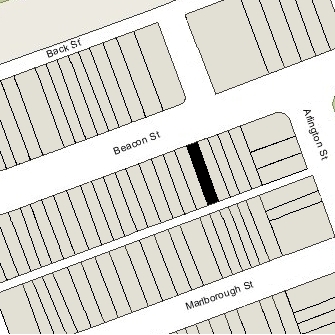 On May 6, 1923, 109 Beacon was purchased from A. Winsor Weld by Shirley Clifford Speed, a real estate dealer who converted many Back Bay houses into lodging houses and apartments. On November 23, 1923, 109 Beacon was acquired by Gertrude (Wilcox) Birch John, the wife of auction house owner Frank L. John. They lived in Allston and then in Brookline. By the 1923-1924 winter season, 109 Beacon was the home of Mrs. Lora Millais (Mitchell) Hamilton, the widow of Edwin C. Hamilton, and their son, Edwin, Jr. They previously had lived in Maine. She operated 109 Beacon as a lodging house. They continued to live there in 1925. By the 1925-1926 winter season, 109 Beacon had become the home of Mrs. Mary Abby (Manning) Lyttle, the former wife of William G. Lyttle, who continued to operate it as a lodging house. She previously had lived at 1125 Commonwealth. 109 Beacon changed hands several times, including going through two foreclosures. 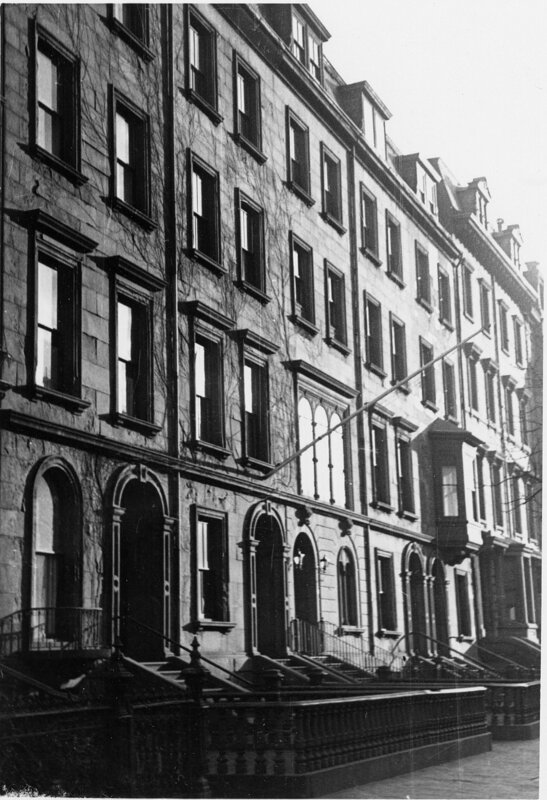 Mary Lyttle continued to live there and operate it as a lodging house, and on February 17, 1937, she purchased the property from the Massachusetts Hospital Life Insurance Company. She continued to live and operate a lodging house there until about 1943. On May 23, 1946, 109 Beacon was purchased from Mary Lyttle by Matthew Joseph Malloy and his wife, Ione Wilkinson (Lohr) Malloy. They lived at 227 Marlborough and operated the Stratford School at 128 Commonwealth. They continued to operate 109 Beacon as a lodging house. 109 Beacon changed hands, remaining a lodging house during the 1950s and 1960s. On March 10, 1967, 109 Beacon was acquired by Stelio M. Vavlitis of Framingham. The house remained vacant in 1972, and probably throughout most of the 1970s. On August 21, 1979, James C. Fullerton and Gordon Smith, trustees, foreclosed on the mortgage they held from Stelio Vavlitis and sold 109 Beacon to Ferdinand J. Kiley, III, trustee of the 109 Beacon Realty Trust. That same month, Ferdinand Kiley filed for (and subsequently received) permission to convert 109 Beacon from a lodging house into six apartments. 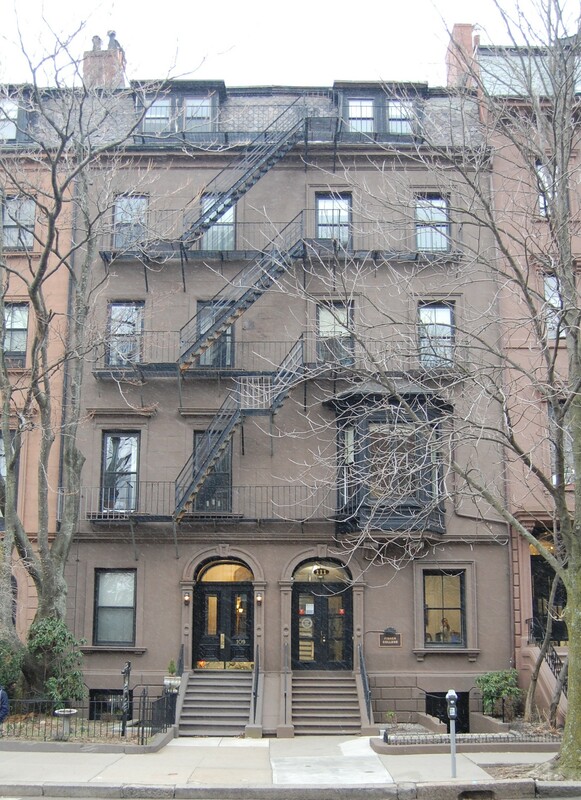 On January 15, 1980, converted the apartments into six condominium units, the 109 Beacon Street Condominium.